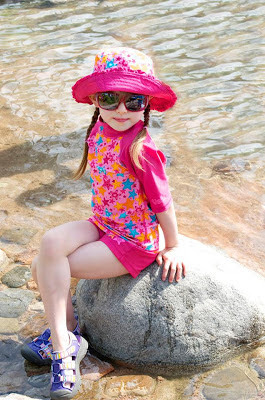 If you’re looking for great swimwear for your kiddos, then you have to check out this place uvskinz.com. I was given the opportunity to review their products and my daughter just loves them. They fit perfect on her, the quality is awesome as well as the comfort when she wears them. What I received are the short sleeve swim shirt, play bottoms and the reversible bucket hat and it matches with all the outfits. The cool thing about wearing these products is that they can be worn even when not in the water. This sun wear is all you need to have your kids covered from the sun and they are made of soft, breathable stretch knit sun fabrics. They are chlorine and salt water resistant with certified UPF 50+. To browse some of their cute and stylish sun wear, check out this place, UVSkinz, become their Facebook and Twitter fan and keep your child’s skin healthy while they are have fun outside this summer.